The MeshNet Wireless Sensors all feature a highly accurate temperature sensor, programmable transmission rate, and a 2.4GHz radio allowing for global deployment. How far between the Sensors & the Controller? The MeshNet Gen 2 sensors are capable of transmitting up to 1,200 meters (just shy of 3/4 of a mile) which is 10 times the distance generation 1 could achieve without repeaters. Repeaters could add up to another 2,400 meters (1,200 meters to the Controller and 1,200 meters to the sensor). Do you need battery backed logging? 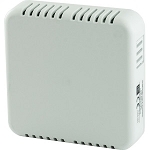 The Gen 2 MeshNet Sensors contains an internal log which prevents data loss if ever the Ethernet Network or Power fails. It is capable of storing between 1024 and 2048 (model dependent) complete sets of the Temperature, Humidity, and/or External Temperature Probe readings. This will allow data to be stored for 10 days (1024 buffer capacity) at a 15 minute log/transmission rate. Monitoring wet locations or extreme temp ranges? All of the Gen 2 MeshNet sensor line will allow you to connect a stainless steel temperature probe which may be submerged. 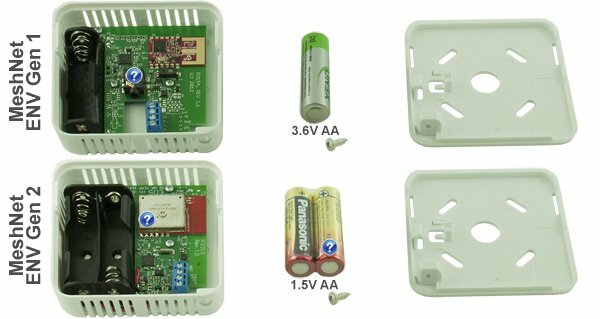 The MN-ENV-H-X-WP should be utilized in applications where the transmitter portion of the sensor must also be subjected to the wet environment. The temperature probes are also capable of monitoring temperatures as high as 125°C (257°F) and as low as -55°C (-67°F). Do you want the ability to control a relay? The Gen 1 MeshNet ENV sensor is available with an optional relay. The sensor is capable of controlling the relay automatically in response to alarm conditions or under user commands. What's a discrete input or a pulse counter? Discrete inputs enable all MeshNet sensors (except for the weatherproof model) to monitor an open/closed state. This functionality paired with a pressure switch, push button, or glass read switch provides you flexibility to track things like the state of doors/windows. See our app note, Utilizing the MeshNet ENV Sensor's Discrete Input for more details. The discrete input within the Generation 1 hardware also features a pulse counter. This can be highly beneficial since it allows you to detect the number of opens/closing instead of just the current state. Is light or barometric pressure monitoring needed? All MeshNet Sensor lines offer Temperature and Humidity monitoring options. However, the Generation 1 Sensors are also available with Barometric Pressure and Light sensors.